With Explore you can easily apply a variety of layouts for both the home and directory listing pages. Display an interactive map when your users first arrive to your site or provide a realtime map with your listings. A variety of easy-to-use modules allows you to display latest events, new products and even an interactive map and products and services can be easily found with a fully integrated search and browse system, along with powerful filters to narrow down search results. Explore modules also feature a two-level title so you can provide a blurb or catchphrase under the main heading. We at ComDev are excited to announce the release of our new JomDirectoy-focused template, Explore. Explore introduces the latest look for directory listing sites, integrating seamlessly with ComDev's flagship extension JomDirectory. Explore is ultra-modern, featuring the latest designs from some of the most popular sites on the web, all out-of-the-box so you can spend more time building traffic instead of building your site. 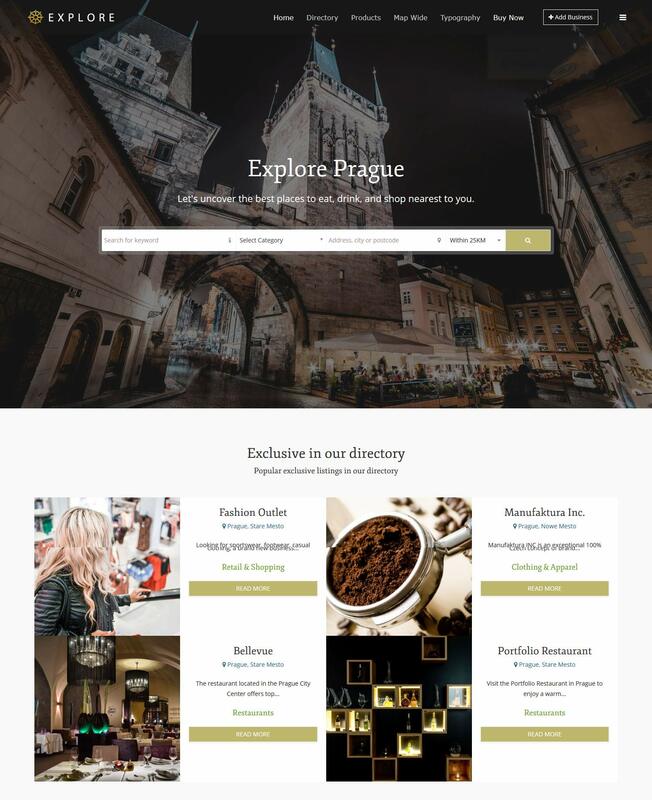 Explore features a host of rich feature designs that are easy to implement and is ideal for a directory of location-based products and services. Explore is designed in a similar vein to big-name sites such as AirBnb and Uber but without the expensive development costs. It also fully responsive thanks to UIKIT, so users can access your site across all device types. Designers will also love the ease of UIKIT, so they can spend more time adding new features and functionality without having to worry about whether the site is running on a phone or on a computer. Subtle animations make Explore come alive without overwhelming the usability of your site. Explore comes with Customiser, an easy-to-use css editor makes it easier than ever to extend your site's styling with your preferred look and feel. And fixed and overflow headers allow users to scroll down the page while still providing access to the site's main menu. Searching and browsing products and services is already super easy with JomDirectory; with Explore, search usability is enhanced further with beautiful filter tools and a fully-integrated real-time map. Explore allows you to easily change the layout of your home page out-of-the-box. No cumbersome hacks or expensive design; swap between different home page layouts with ease; choose between different category layouts or provide an interactive map for location browsing. A number of layout styles are also available for your listings; Grid, Simple, List and Side. The "Side" layout provides an integrated real-time map on the left and associated products on the right just like AirBnb. Explore comes with a ton of preconfigured headings, fonts, box layouts, buttons, dropdowns, tabs and form elements ready to use out-of-the-box. Styles can also be easily implemented by using CSS declarations directly within your content. You can also configure two-level headers in your modules, allowing you to provide a blurb or catchphrase under the main heading. Explore is designed from the ground-up to work with JomDirectory, ComDev's powerful business directory and catalog extension for Joomla. With Explore and JomDirectory, you can provide an enterprise-level directory experience without the expensive price tag.